6 Chicken Wontons: Chicken and mixed vegetables in pastry. 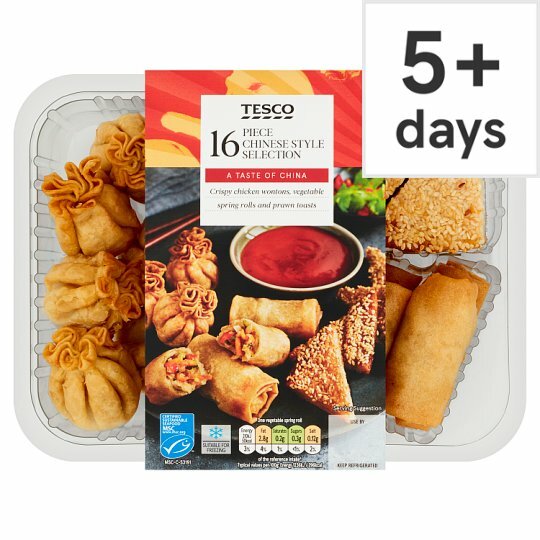 6 Vegetable Spring Rolls: Crisp pastries filled with red peppers, beansprouts and water chestnuts, flavoured with ginger, garlic and sesame oil. 4 Prawn Toasts: Minced prawn and vegetables on white bread topped with sesame seeds and water chestnuts. A sweet chilli dip with garlic, chill and red pepper. Keep refrigerated. Once opened, consume within 2 days and by 'use by' date shown., This product was previously frozen and has been restored to chill temperature under carefully controlled conditions. Defrosted: It is still suitable for home freezing. Instructions: Place product onto a wire rack over a baking tray in the centre of a pre-heated oven for 12-14 minutes. Instructions: Place product on a wire rack over a baking tray in the centre of a pre-heated oven for 15-17 minutes. Do not re-heat. Serve with dip. Remove all packaging and dip. Suitable for home freezing. Ideally freeze as soon as possible after purchase but always before the 'use by' date shown.This product was previously frozen and has been restored to chill temperature under carefully controlled conditions. Defrosted: It is still suitable for home freezing. Defrost sweet chilli dip thoroughly and stir before useImportant: If food has thawed, do not refreeze. Caution: Although every care has been taken to remove bones and shell, some may remain. Keep refrigerated. Once opened, consume within 2 days and by the 'use by' date shown. This product was previously frozen and has been restored to chill temperature under carefully controlled conditions. Defrosted: It is still suitable for home freezing. 4 Minced prawn and vegetables on white bread topped with sesame seeds and water chestnuts. Prawn (Crustacean) (32%), Rapeseed Oil, Wheat Flour (Wheat Flour, Calcium Carbonate, Iron, Niacin, Thiamin), Water Chestnut, Water, Sesame Seed, Dried Egg White, Salt, Sugar, Yeast, Potato Starch, Emulsifiers (Mono- and Di-Glycerides of Fatty Acids, Mono- and Di-Acetyl Tartaric Acid Esters of Mono- and Di-Glycerides of Fatty Acids), Wheat Gluten, Spirit Vinegar, White Pepper, Flour Treatment Agent (Ascorbic Acid). Keep refrigerated. Once opened use within 2 days and by 'use by' date shown. This product may have been previously frozen and has been restored to chill temperatures under carefully controlled conditions. Defrosted: It is still suitable for home freezing. 6 Crisp pastries filled with carrot, red peppers, beansprouts and waterchestnuts, flavoured with ginger, garlic and sesame oil. This product has been previously frozen and has been restore to chill temperature under carefully controlled conditions. Defrosted: It is still suitable for home freezing. 6 Chicken and mixed vegetables in pastry. Wheat Flour (Wheat Flour, Calcium Carbonate, Iron, Niacin, Thiamin), Chicken Breast (20%), Rapeseed Oil, Carrot, Red Pepper, Potato, Peas, Rice Flour, Spring Onion, Water Chestnut, Ginger Purée, Garlic Purée, Salt, Water, Sugar, Sesame Oil, Wheat Gluten, Soya Bean, Wheat, Stabiliser (Hydroxypropyl Methyl Cellulose), White Pepper, Chilli Powder.